In Be Prepared, which recently opened at the Edinburgh Fringe, Lesley Stone shines as the delightful, somewhat hapless but always funny, badge-obsessed founder of ‘Guides Reunited’, a fictional new branch in the Girl Guiding movement. Stone is consistently entertaining throughout the show: With Guiding anecdotes, clever adages and witty songs. Highlights of the show were the audience singalong about a frustrated donkey, as well as the ‘litterbug’ rap, complete with baseball cap decorated with badges and ‘singing’ reach extender. After the show, I found myself still chuckling over Stone’s humour, and enthusiastically making the three-fingered Girl Guide salute. 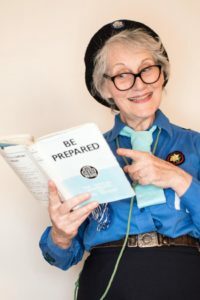 Stone is a natural comedienne, and she uses both her considerable charm, as well as the nostalgia factor of the Guiding movement to win the hearts of her delighted audience. If there were a badge for ‘Fringe Performing’, Stone would certainly deserve it!